The Kansas STAR bonds program provides a mechanism for spending by autopilot, without specific appropriation by the legislature. 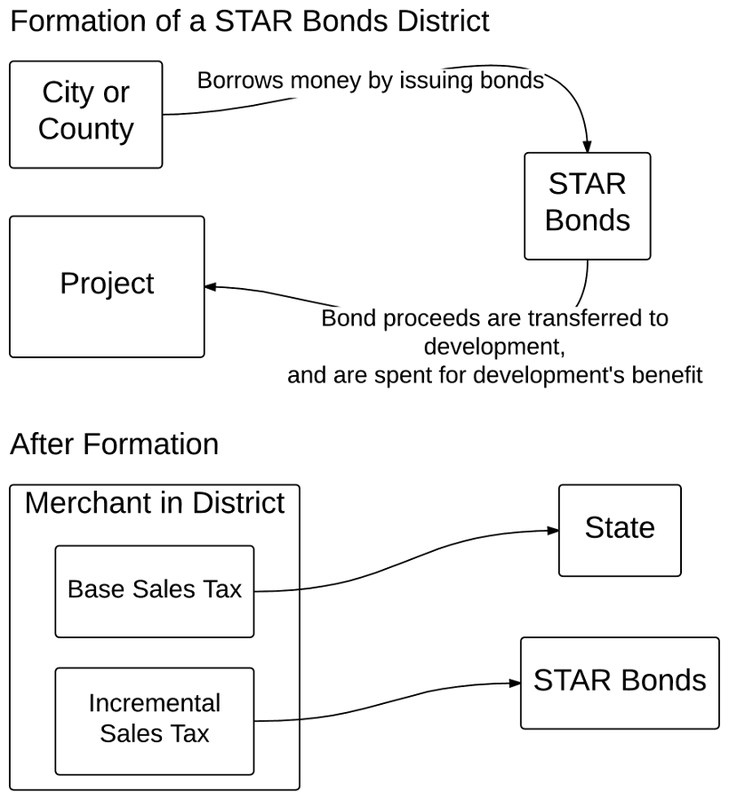 Under the State of Kansas STAR bonds program, cities sell bonds and turn over the proceeds to a developer of a project. As bond payments become due, incremental sales tax revenue make the payments. STAR bonds in Kansas. Click for larger version. It’s only the increment in sales tax that is eligible to be diverted to bond payments. This increment is calculated by first determining a base level of sales for the district. Then, as new development comes online — or as sales rise at existing merchants — the increased sales tax over the base is diverted to pay the STAR bonds. Often the STAR bonds district, before formation, is vacant land, and therefore has produced no sales tax revenue. Further, the district often has the same boundaries as the proposed development. Thus, advocates often argue that the bonds pay for themselves. Advocates often make the additional case that without the STAR bonds, there would be no development, and therefore no sales tax revenue. Diverting sales tax revenue back to the development really has no cost, they say, as nothing was going to happen but for the bonds. This is not always the case, For a STAR bonds district in northeast Wichita, the time period used to determine the base level of sales tax was February 2011 through January 2012. A new Cabela’s store opened in March 2012, and it’s located in the boundaries of STAR bonds district, even though it is not part of the new development. Since Cabela’s sales during the period used to calculate the base period was $0, the store’s entire sales tax collections will be used to benefit the STAR bonds developer. Which begs the question: Why is the Cabela’s store included in the boundaries of the STAR bonds district? With sales estimated at $35 million per year at this Cabela’s store, the state has been receiving around $2 million per year in sales tax from it. But after the STAR bonds are sold, that money won’t be flowing to the state. Instead, it will be used to pay off bonds that benefit the STAR bond project’s developer — the project across the street. Taxation for public or private benefit? STAR bonds should be opposed as they turn over taxation to the private sector. We should look at taxation as a way for government to raise funds to pay for services that all people benefit from. An example is police and fire protection. Even people who are opposed to taxation rationalize paying taxes that way. But STAR bonds turn tax policy over to the private sector for personal benefit. The money is collected under the pretense of government authority, but it is collected for the exclusive benefit of the owners of property in the STAR bonds district. Citizens should be asking this: Why do we need taxation, if we excuse some from participating in the system? Another question: In the words of the Kansas Department of Commerce, the STAR bonds program offers “municipalities the opportunity to issue bonds to finance the development of major commercial, entertainment and tourism areas and use the sales tax revenue generated by the development to pay off the bonds.” This description, while generally true, is not accurate. The northeast Wichita STAR bonds district includes much area beyond the borders of the proposed development, including a Super Target store, a new Cabela’s store, and much vacant ground that will probably be developed as retail. The increment in sales taxes from these stores — present and future — goes to the STAR bond developer. As we’ve seen, since the Cabela’s store did not exist during the time the base level of sales was determined, all of its sales count towards the increment. In economic impact and effect, the STAR bonds program is a government spending program. Except: Like many spending programs implemented through the tax system, legislative appropriations are not required. No one has to vote to spend on a specific project. Can you imagine the legislature voting to grant $5 million per year to a proposed development in northeast Wichita? That doesn’t seem likely. Few members would want to withstand the scrutiny of having voted in favor of such blatant cronyism. But under tax expenditure programs like STAR bonds, that’s exactly what happens — except for the legislative voting part, and the accountability that (sometimes) follows. 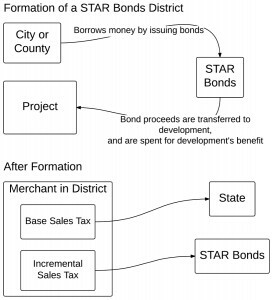 Government spending programs like STAR bonds are sold to legislators and city council members as jobs programs. Development and jobs, it is said, will not appear unless project developers receive incentives through these spending programs. Since no politician wants to be seen voting against jobs, many are susceptible to the seductive promise of jobs. But often these same legislators are in favor of tax cuts to create jobs. This is the case in the Kansas House, where most Republican members voted to reducing the state’s income tax as a way of creating economic growth and jobs. On this issue, these members are correct. But many of the same members voted in favor of tax expenditure programs like the STAR bonds program. These two positions cannot be reconciled. If government taxing and spending is bad, it is especially bad when part of tax expenditure programs like STAR bonds. And there’s plenty of evidence that government spending and taxation is a drag on the economy. It’s not just legislators that are holding these incongruous views. Secretary of Commerce Pat George promoted the STAR bonds program to legislators. Governor Sam Brownback supported the program. The word “capitalism” is used in two contradictory ways. Sometimes it’s used to mean the free market, or laissez faire. Other times it’s used to mean today’s government-guided economy. Logically, “capitalism” can’t be both things. Either markets are free or government controls them. We can’t have it both ways. The truth is that we don’t have a free market — government regulation and management are pervasive — so it’s misleading to say that “capitalism” caused today’s problems. The free market is innocent. But it’s fair to say that crony capitalism created the economic mess. The danger of Kansas government having a friendly relationship with Kansas business is that the state will circumvent free markets and promote crony, or false, capitalism in Kansas. It’s something that we need to be on the watch for. 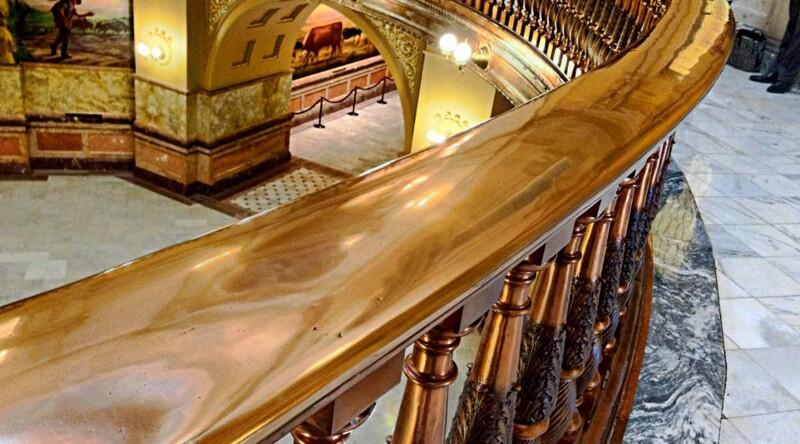 The existence of the STAR bonds program lets us know that a majority of Kansas legislators — including many purported fiscal conservatives — prefer crony capitalism over free enterprise and genuine capitalism. Government bureaucrats and politicians promote programs like STAR bonds as targeted investment in our economic future. They believe that they have the ability to select which companies are worthy of public investment, and which are not. It’s a form of centralized planning by the state that shapes the future direction of the Kansas economy. Despite this knowledge problem, Kansas legislators are willing to give power to bureaucrats in the Department of Commerce and politicians on city councils who feel they have the necessary knowledge to direct the investment of public funds. One thing is for sure: the state and its bureaucrats and politicians have the power to make these investments. They just don’t have — they can’t have — the knowledge as to whether these are wise. The STAR bonds program is an “active investor” approach to economic development. Its government spending on business leads to taxes that others have to pay. That has a harmful effect on other business, both existing and those that wish to form. There is also substantial research that is it young firms — distinguished from small business in general — that are the engine of economic growth for the future. We can’t detect which of the young firms will blossom into major success — or even small-scale successes. The only way to nurture them is through economic policies that all companies can benefit from. Reducing tax rates is an example of such a policy. Government spending on specific companies through programs like STAR bonds is an example of precisely the wrong policy. We need to move away from economic development based on this active investor approach. We need to advocate for policies at all levels of government that lead to sustainable economic development. We need political leaders who have the wisdom to realize this, and the courage to act appropriately. Which is to say, to not act in most circumstances.